Between Lattes: Nominated for the One Lovely Blog Award! 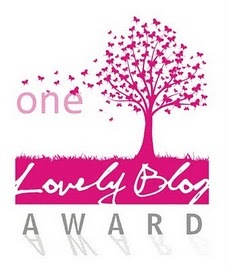 Nominated for the One Lovely Blog Award! Ever since I started blogging a little over three years ago, I've always felt a pang of shameless envy each time I see a blogger being nominated for or given a blog award - all the time wondering when on earth I'll finally be honoured with one myself. Last year of course, as some of you know, I won the Big Blog Exchange (BBE) 2014, ensuing which was an amazing cross-cultural exchange for me and 15 other bloggers from around the world. So in a way, I suppose you could say I'm just being greedy as I've already won "the big one". However, the BBE works in a different way; the contest involves a preliminary voting process and of course a final selection of winners by a panel of international jury. Blog awards, on the other hand, come from fellow bloggers and writers - or, in short, peers. They carry especial meaning because they signify, really, recognition from those who understand first-hand the inevitable trials and tribulations that come with writing good, sound literature. I am therefore delighted to announce that Between Lattes was recently nominated for one such award - the One Lovely Blog Award, my first - by Ms Beryl Belsky who is a published author as well as the creator of The Writer's Drawer and an academic editor with a university in Israel. With such credentials weighing on my nominator's name, do forgive me if I seem unashamedly-chuffed by the whole thing. Thank you, Ms Belsky, for nominating my blog; I am humbled by your nomination and I (likewise) humbly accept the award. Nominate 15 bloggers you admire and duly inform them by commenting on their blog. Once again, thank you, Ms Belsky for acknowledging how "lovely" my blog is. I'm 50 as I write. I run a coffee shop and work 14 hours a day. Blogging is a hobby. I enjoy writing - always have. I once aspired to be a writer but my utter lack of creativity and literary flair saw to it that I instead become a banker for 19 years before going on to be a barista. I started this blog to document my trip to India in Dec 2011 but found myself gradually falling in love with the activity (it's like rediscovering an old passion). I guess one post led to another and Between Lattes has since evolved into something more than a mere travel journal. I am utterly consumed by wanderlust and thoughts of seeing a foreign land are never too far from my mind. I'm a bit of a nerd. But aren't all bloggers? I was one of the 16 lucky winners of the Big Blog Exchange (BBE) 2014 and embarked on an 11-day cultural exchange across Argentina in November 2014 courtesy of Hostelling International. Click HERE to read about my adventures in South America. To view my BBE video epilogue, click HERE. Viajar en Pelotas. Belen is my well-travelled Argentine exchange partner in the Big Blog Exchange. Combining excellent videos and photos with good writing in her translatable Spanish blog, she writes mainly of her travels around the globe. Como estas, Belu? Secret Passage in a Bilberry Pie. Although Margarita blogs mainly about fashion, she also tells us of her travels (especially within Russia) and her occasional foray into the realm of baking. Good photographs. Hers is indeed one lovely blog. Running the Race. Wife, mom and fitness addict, Karien writes about her running and cycling adventures with good, witty humour and incredible insight. Good fitness and family blog. Spin A Yarn. Looking to kill time with a good short story or three? Look no further; prepare to be amazed by Alister's quality descriptive writing. Simply Beautiful. Erica's my niece and only started blogging (on my encouragement) two months ago. So far, she's written about her travels to Paris and the UK; more will follow no doubt. Do visit her site and provide feedback - but be gentle; she's new. Journal of a Nutritionist Mom. It's recipes galore from Jennifer here. She writes about health food, mood food and motherhood with unbelievable passion. Excellent pictorials with each recipe. And she's from my hometown! Dea Sihotang. Let Dea take you on a virtual journey through her lovely home country of Indonesia. She writes of her adventures in great detail and often displays a profound view of things that is uncharacteristic these days of people her tender age. I really like Dea's blog. Once again, thank you, Ms Belsky for the nomination and I hope you, my dear readers, will take a look at these other unique and talented bloggers' sites which I've just mentioned. Remember, the One Lovely Blog Award seeks to recognise new and/or emerging bloggers for their work and help them grow their audience. So where you feel there's merit for doing so, do spread the love of their blogs. Congratulations on the award, Vince! Well earned. Thanks so much for the nomination too - very honoured indeed! You're so welcome, Karien. Don't forget to put the sticker up on your blog. I'm good, thank you, Belen. You so deserve this award. Do display the sticker on your blog! I miss Argentina too. Such a lovely place. What should a Blogger Do to get a Traffic?